I just learned about a beautiful little boy named Zhenya, in Russia, who is suffering from hydrocephalus. He needs the focused attention of millions of people all over the world, sending him their prayers and visualizations, to see him protected and his health completely restored. Pray to guide his doctors. His mother and grandmother need comfort too, and have asked for a miracle. When you read this, please take a moment or moments in your day, for Zhenya. Share this widely, to create a global prayer circle for him. Doctors from St. Petersburg examine the boy with gigantic head, who had arrived in the city from Chelyabinsk with his mother and grandmother. 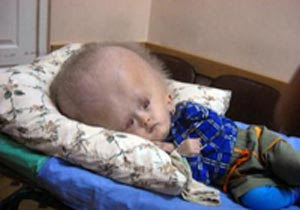 The little boy, Zhenya Sevostyanov, suffers from a rare disease known as hydrocephalus. Hydrocephalus, also known as "water on the brain", is a medical condition in which there is an abnormal accumulation of cerebrospinal fluid (CSF) in the ventricles, or cavities, of the brain. This may cause increased intracranial pressure inside the skull and progressive enlargement of the head, convulsion, and mental disability. Hydrocephalus can also cause death. Medics of Polenov’s Research Institute in St. Petersburg were expecting the child. The city’s most prominent medical specialists will examine the little boy and appoint all necessary analyses. The medics will then gather for a consultation to set the date for the important surgery. “I hope so much that surgeons will change the shape of my son’s skull. I don’t want to think about the worst, I am sure that such experienced doctors as they have here can work miracles,” the boy’s mother said with tears in her eyes. As soon as Zhenya arrived at the hospital, the boy fell asleep as soon as he was put on his bed with a special pillow, which the doctors had designed for him. “I will live here, in the ward with my son. Doctors say that there are no contraindications to surgery. He can see and hear, which means that we have a chance,” Zhenya’s mother said. You are in my thoughts and prayers baby boy.